Dr Doolittle™ Quack or The Real McCoy? Ever wonder what would it be like to talk with the animals? Everybody loves the idea of having the gift of talking to the elephants, the chimpanzees, the Beverly Hills Chihuahuas, Felix the cat, Trigger or their favorite race horses, Willy (the whale from Free Willy the movie)… the very idea captures the imagination! Every animal lover, young and old, has spent some time at some point wondering and wishing (and hoping and praying) their animals would suddenly speak to them. Oh the things they could tell you… if only you could hear their voices! Sure, we animal lovers talk TO our animals – all day long. We baby talk, and coo, and fuss at them and we like to pretend that they understand us. The problem is that most of us never hear them say much back. It seems to be pretty much a one sided conversation. They just look at us with those soulful eyes, intent long stares that make you wish you were privy to their thoughts. You know they would love to tell you the secrets of the universe (or the latest neighborhood gossip) – if only you could hear them. So is Dr Doolittle totally quacked – or is it really possible to hear what animals are thinking? Naysayers think animals are dumb beings who can’t feel, think or reason; a non-intelligent species who couldn’t string two sentences together. And after all, for folks who need things to be proven to them before they’ll attempt to understand something beyond their normal scope of what they have decided is or isn’t possible, and since animals don’t communicate with words in a spoken or written language, they simply can’t argue very convincingly in their favor. But I say Nay-Nay! As a professional animal communication expert, often called The Real Dr Doolittle, I have to tell you, it really is true. I’ve enjoyed many an intelligent conversation with animals of all types, shapes and sizes. Not only that, but I firmly believe you can too if you put a bit of effort into learning a new skill. For instance, they’ve taught me about the importance of smells – and what amazing information that body of knowledge entails. Did you know that cancer smells different to an animal? Dogs have long been used to sniff out tumors in humans, they often know before a child is going to have a seizure and can warn their person when the insulin in their body is dropping to dangerous levels. I know a delightful Bichon Frise named Romeo who does exactly that. Dolphins are able to pinpoint and identify objects behind closed doors. KoKo the gorilla knows hundreds of words and concepts in American sign language. Koko even makes up his own words when he needs to express something he’s feeling but hasn’t been taught the sign for that yet. And I just heard about someone who teaches sign language to dogs, cats and horses who do the same thing. I find animals often wiser than many a human I’ve met. They are amazing sentient beings with unique viewpoints, insights and clarity about what they need to be happy. Ever met a human who shows no apparent signs of intelligence? Personally, watching the incredibly stupid stunts humans do makes me worry about our species. Humans as a species can be as unreasoning as a rock (no offence to the rocks), as unfeeling as an ice cube (no offense to water), and act as silly as a tub of jello (and even though I liked jello as a kid, I’m not apologizing for that one…). Animals have a remarkable way of touching our hearts, helping us feel unconditional love, of showing us what they are feeling and thinking every moment of their lives… if we have the wits, know-how and intelligence to learn how to understand THEIR rich, profound and wise language. 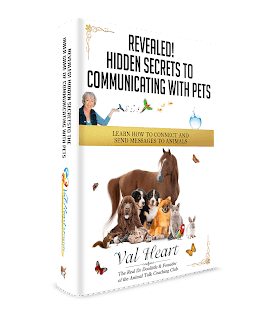 Animals communicate through telepathy (the energetic language of the mind and heart), and through body language, emotions and vocalizations just like we do. It’s important to pay attention and become more consciously aware of yourself as fundamentally an energy being. They know how to be honest with what they’re really feeling. They know to rest when they’re tired, to ask for what they need, and to eat when they’re hungry. Not every human I know does this consistently, including moi. They know how to be patient, loving and kind. They know when to act to protect their stuff, who to trust and of whom to be wary. They know how to accept the reality of life and not argue with what is. They know how to embrace, connect and play with others. They know how to be fully present and use all their senses. They know how to live a good life. And they rarely ever have regrets when they come to the end of their life’s journey. Animals teach us how to be better humans with their wisdom, love, compassion, insights and viewpoints. Their gift is to reconnect us to the wisdom of the planet and intelligence of other beings. And after all, we humans can use a little help too. © Copyright Val Heart & Friends, LLC. All Rights Reserved.